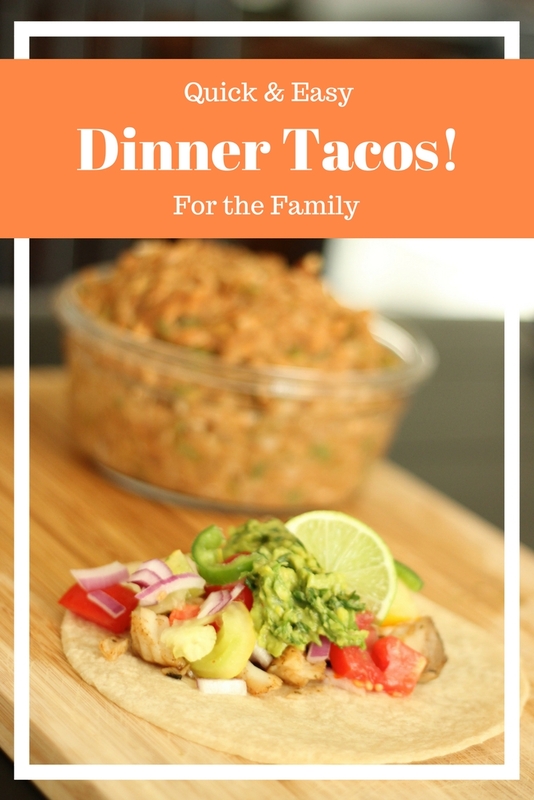 Favorite Family Dinner Meals- Quick and Easy Fish Tacos! With the warmer weather we've been having here in sunny Northern Cal (70 degrees! ), tacos have been such a refreshingly sounding dinner option for the family vs the usual cozy winter soups. After weeks of heavier cooking and dinner recipe experimenting, I can always rely on the quick, easy, and healthy option of tacos to give me a break and still fill my family up in a balanced way. This recipe can be made in so many different ways depending on what your family likes or what is on hand in the fridge. I aim to make sure there are components of lean proteins, healthy fats, complex carbohydrate and some fresh veggies involved (yes, I know tomatoes are technically a fruit!). On weeks where we've already had enough red meat, I like to go for a fish meat option as a nice and different change from chicken which is our most eaten meat choice. Some of the best fish options for fish tacos include tilapia, halibut or cod. For fresh veggies, our local Co-Op grocery store had these delicious heirloom tomatoes in season and we took full advantage of using them as a beautiful highlighting topper to the tacos. For healthy fats there is a homemade guacamole (==> recipe) full of flavors of lime and garlic. Avocados are a great option for healthy fats vs the usual cheese topping. For spice, I usually just buy the pre-mixed taco seasoning and look for packets that have minimal preservatives, pesticides etc. The goal here is to be quick! So I am okay with the occasional pre-packaging for spices in this instance. We love the organic artisan corn tortillas from Mi Rancho for our complex carbs. Next comes some sliced red onions, a sprinkle of chopped jalapeños and a spritz of fresh lime juice for a flavor bursting mouthful with each bite. On the side, for additional fiber and protein, I like to mix some refried beans and brown rice for a nice take on the traditional casamiento dish. I add some himalayan pink salt and fresh garlic for additional flavor. This rice and bean dish is a great, easy to chew option for getting more nutrient-dense calories in my toddler daughter who can be quite the picky eater at times. So this is a very basic show of some thought processes involved when meal prepping and whipping up dinner on the go! Lean protein, healthy fats, and complex carbs centered around some fresh veggies. Tweak it, make it just as is- you've got options to keep things flavorful and fun in the kitchen with (hopefully) minimal effort. See below for more pictures!